The gap between the holidays and the New Year is always a confusing one, where you tend to lose track of time and can’t remember how long you’ve been wearing the same set of sweats. But somehow, even in the stupor of that twilight zone, we usually find ourselves thinking about the return of Smorgasburg: Downtown’s weekly food festival, which shuts down for a month each year, usually until mid-January. This Sunday it’s back, and we’re pleased to report that it’s got some big new names up its sleeves. Last year there were some phenomenal newcomers, and while 2019’s opening announcement features fewer newbies, there’s a good chance more could be added as the year progresses. After all, Katsu Sando joined the lineup later on in 2018—so it’s always wise to keep your eyes on Smorgasburg’s Instagram account for vendor additions as 2019 wears on. Of course, it wouldn’t be Smorgasburg L.A. without the classics, so you know vendors like Ugly Drum, Lobsterdamus, Cheezus, Shrimp Daddy and Amazebowls will all still be slinging their colorful, line-worthy goods this year, too. With so much goodness, your Sundays can start to feel a little overwhelming; here’s our guide to what’s new for 2019, to help you strategize your plan of attack this weekend and beyond—as if you hadn’t already been planning it. This is where you’ll also be able to catch the fresh, in-the-shell Santa Barbara sea urchin from local legend Stephanie Mutz this year, and if you’re still craving oysters, don’t worry: You can find the briny bites at Smorgasburg mainstay the Jolly Oyster next door, who’ll continue serving their succulent fresh-from-the-farm Baja bivalves. 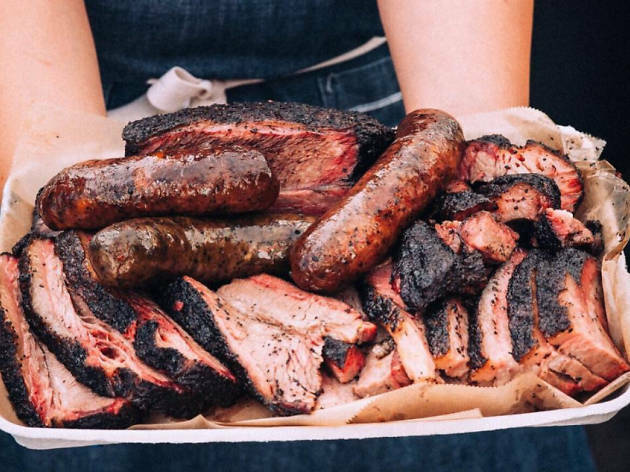 How do we love Moo’s Craft Barbecue? Let us count the ways. 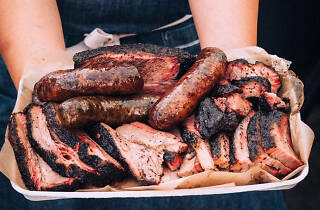 Andrew and Michelle Muñoz’s home-grown Texas-style BBQ operation is a labor of love, and the husband-and-wife team’s labor pays off: The brisket’s smoked for around 14 hours and is unbelievably tender, and is hands-down some of the best this city’s ever seen. The sausages are so good, they were one of our best bites of 2018. But it’s not just Texas flavor and a hell of a lot of care that makes Moo’s special. The Muñozes add East L.A. flavor to their BBQ plates, offering sides like esquites, made with corn kernels shaved freshly off the cob. These guys can draw a serious crowd, but don’t let the line scare you—the wait is more than worth it. Some of L.A.’s most sought-after, new-to-the-scene taqueros got bumped from their Hollywood street corner, but thankfully, they’ve found a permanent Sunday space at Smorgasburg. Tacos 1986 serves serious flame-licked meats in fresh corn tortillas and slathers it all in a guacamole sauce, Tijuana-style. There’s even a vegetarian option. This stall made an appearance last month as a vendor at Smorgasburg’s Santa Monica Pier holiday market, and now they’re going permanent Downtown—and we’re so, so grateful. And when it’s not Sunday but you’re still craving Tacos 1986, you can find them popping up in K-town, for now. Last year the fest launched the Smorgasburger Stand, where chefs from near and far threw down their own unique burgers for one-day stints or a weeks-long residency (see: NYC-based Burger Supreme, pictured above). In 2019 the burger shack is back, and it’s got a great lineup right out of the gate. This Sunday, catch chef Darren Sayprahaj from We Have Noodles slinging a patty melt that’s made with dry-aged beef. On January 20, Here and Now’s chef Geo Delgado will be whipping up the bar’s signature burger, which involves American cheese, shallots and a house-made Boyle Heights sauce on potato bun, and closing out January is the one and only Charles Olalia of RiceBar and Ma’am Sir fame, who’ll be stacking a Filipino-inspired burger. Looking ahead to February—because trust us, these are probably worth planning for—you can expect a burger from Rossoblu’s Steve Samson, as well as one from Rustic Canyon’s chef de cuisine, Andy Doubrav. Smorgasburg returns to the ROW DTLA complex this Sunday, January 13, from 10am to 4pm at 777 Alameda Street in the Arts District.